Rajasthan Royals 5-182 (Ajinkya Rahane 67, Rahul Dravid 58, Wayne Parnell 3-27) beat Pune Warriors 4-178 (Robin Uthappa 54, Aaron Finch 45, Siddharath Trivedi 1-33) by five wickets. Pune Warriors scored 178 runs for the loss of four wickets in the allocated 20 overs and Rajasthan Royals powered 182 with five wickets intact in 19.5 overs. Ajinkya Rahane (Rajasthan Royals) was announced ‘Player of the match’ for his brilliant knock of 67 off 48 balls. The 50th match of the Indian Premier League was played on Sunday, May 5, 2013, at Sawai Mansingh Stadium, Jaipur. Earlier, Aaron Finch won the toss for Pune Warriors and came into the park with Robin Uthappa to open the innings. They took off briskly by scoring 30 runs in the first three overs with 3 fours from Finch and two from Uthappa. The latter added another three boundaries in the next over and Finch carried on with the business at the other end while sending the ball out of the fence regularly. They shared a 97 runs partnership in 10.5 overs as Aaron Finch was clean bowled by Kevon Cooper for 45 off 32 balls with 7 fours. Yuvraj Singh came in next and hit 1 six and 1 four in the 13th over as Robin Uthappa attained his fifty in the following over with 2 fours. The poor form of Yuvraj Singh continued when he was caught by Cooper at deep midwicket off Siddharath Trivedi for 15 as the total touched 124. Robin Uthappa was run out five runs later for 54 off 41 with 1 six and 8 fours. Mitchell Marsh played a breezy unbeaten innings of 35 off 21 with 3 lofty sixes and 2 fours as Angelo Mathews was caught by Rahane off James Faulkner for 18. 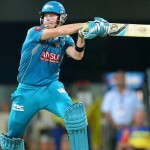 Pune Warriors made a reasonable score of 178 with six wickets remaining at the end of the 20th over. Rajasthan Royals went into bat with their skipper, Rahul Dravid and Ajinkya Rahane as the first hit 4 fours in the initial three overs. Rahane got 12 runs in the next over with 1 six and 1 four and the duo accumulated another 13 runs in the sixth over with 3 boundaries. Rahul Dravid scored his half century in the 11th over with a straight six and became the first victim at 98 at his personal feat of 58 from just 40 deliveries with 1 six and 9 fours. Ajinkya Rahane raced to his fifty in the 14th over with 1 six and 2 fours and he was the third batsman who went back to the pavilion for 67 off 48 with 2 big sixes and 6 fours. The hosts lost their fourth wicket at 150 in 17.1 overs when Stuart Binny and Sanju Samson joined together. Binny was the most adventurous of the two and preferred to get the runs through boundaries as Samson sent the ball out of the rope twice in the 18th over. The latter was gone for 10 on the second ball of the last over as Binny hit the winning four three deliveries later. The home side smashed 182 after losing five wickets with one ball to spare as Stuart Binny occupied his crease for 32 of just 13 balls with 2 smart sixes and even fours. Wayne Parnell was the most successful bowler with three wickets whereas Bhuvneshwar Kumar and Angelo Mathews shared one wicket each. Rajasthan Royals won the game by a margin of five wickets and have grasped the fourth position with 14 points.